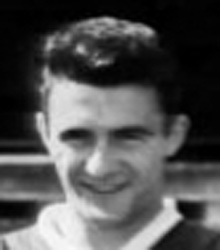 Bobby Wilson (right back, 1961-66) – From Windygates, Bobby Wilson went junior with Dundonald Bluebell and Cowdenbeath stepped in to secure his services. In 1962/63, an injury crisis saw Bobby Wilson switched to right-back. Bobby didn’t miss any of the next 128 League games and thus set a record for consecutive appearances for Cowden. Archie Robertson felt that Bobby’s past experience as a winger and his aggressive style of play made him ideally suited to an overlapping full back role. Dundee United made an offer and Rangers and Falkirk were both watching him. However, Dundee pounced to sign Bobby for a Cowdenbeath record fee of £5,000 in 1966. In 1967, Wilson was honoured with a cap from the Scottish League v Ireland. His career highs included creating the goal that allowed Dundee to win the 1973/74 League Cup final and highly memorable European goals v Cologne and Leeds United. Bobby later enjoyed a great management career with Lossiemouth, Keith and Ross County. He also was Raith Rovers manager and Dunfermline assistant boss.